Our mobile application developers know how to combine rigorous user research, tech excellence and creativity to deliver your audience-winning app. 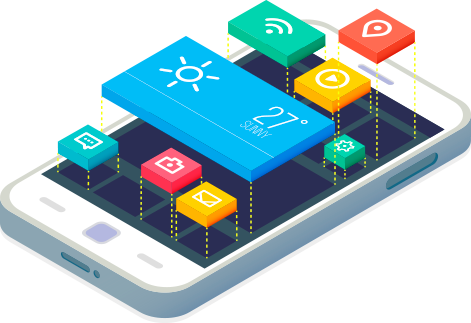 Backing it up with years in mobile application development, we create original solutions that blend best practices and conceptual thinking into a truly powerful mix. Our iOS team keeps up Apple’s golden standards with our exceptional design and backend engineering skills. Our Android developers have an excellent grasp of the technology to turn your idea into an immersive mobile experience. In our hands, your cross-platform app will easily live up to a native one, with its sleek UI and rich features. We’ve made a career as the trusted mobile application developers for well-established businesses and daring startups. We share their passion for innovation and the latest mobile tech that makes it possible. At the first stage we collect and analyze your project requirements to understand the look, feel and features of the app in progress. Our frontend stars get into research-based UX/UI design to come up with an unrivaled visual and functional identity for your app. This is when we put it all together in terms of frontend and backend development and shape the app right before your eyes. Our mobile application developers can get their hands on any device or emulator to test the app’s functions, interoperability and performance. We’ll stay to take care of your app after its release, complete with providing new timely updates and responding to your users’ feedback.